Ok, so it took me a few days longer than I initially expected it to, but it's up and out. 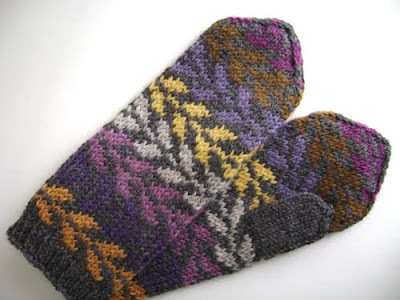 Grab your free copy of the Quo Vadis mitten pattern here on Ravelry or right over here. The Quo Vadis mittens are my early holiday gift to all of you lovely knitters. Happy Holidays 2009! Use as many (or as few) colours as you’d like to create your own unique mittens. Enjoy the mittens...and keep an eye out for those Owls and Robots that will be heading your way soon! The mittens look great & I love th colors. Thanks for the pattern & Happy Holidays to you too. September 20, 2009 at 7:58 p.m.
Super mittens - thanks for the free pattern. Happy holiday knitting! September 20, 2009 at 9:35 p.m. Thank you! Your mittens are just beautiful! September 21, 2009 at 5:48 a.m.
September 21, 2009 at 8:52 a.m.
September 22, 2009 at 4:33 a.m. Very beautiful mittens! Your all patterns are so amazing. Lovely pattern! Thank you so much! September 28, 2009 at 6:48 p.m.
Owlmittens came out last night!